The current late-night “war” is certainly less vitriolic than the previous David Letterman vs. Jay Leno Battle Royale. Stephen Colbert and the Jimmys Fallon and Kimmel are all buddy-buddy, with significantly less mud-slinging. But that will never be the case with their respective television networks—the ratings battle will always live on, and it looks like Fallon is in a bit of trouble for the moment. Fallon, with his Lip Sync Battles and game show sensibilities, enjoyed first place over Colbert and Kimmel for years. But after a tumultuous presidential election and some behind-the-scenes creative shake-ups, the Daily Show alum overtook Fallon in the ratings battle in 2017. And according to Vulture, even Fallon’s lead over Kimmel is shrinking. The viewership gap between The Tonight Show and Jimmy Kimmel Live! narrowed from about one million viewers last year to around 250,000 viewers just last week. Kimmel, formerly of The Man Show and Win Ben Stein’s Money, has become a surprisingly liberal voice in Trump’s America, as the debate over healthcare became personal after his newborn son battled a rare heart condition. Since then, Kimmel has become heavily involved in the nationwide discussion, also delivering several widely watched monologues on the subject. As Vulture summarizes, Fallon’s ratings are 16 percent behind Colbert, and only the now-smaller margin of 10 percent over Kimmel. Fallon’s hair tousling of then-candidate Donald Trump has become infamous, and is cited as a starting point for Fallon’s rating decline. 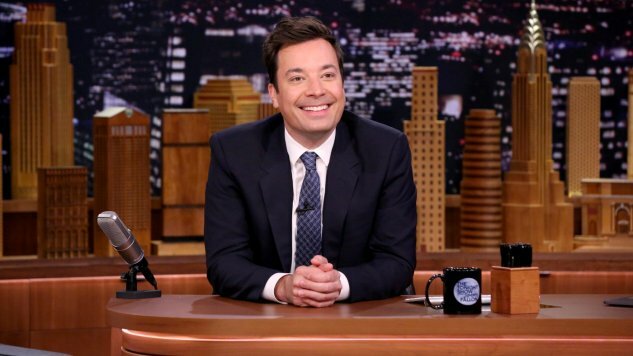 NBC will still tout Fallon’s performance in a key demographic: the young ‘uns below the age of 50. But for “the nicest guy in show business” to bounce back up as the King of Late Night, Fallon will either have to wait for the public to get tired of anti-Trump humor, or maybe spend less time playing Pictionary with celebrities and find something to say.